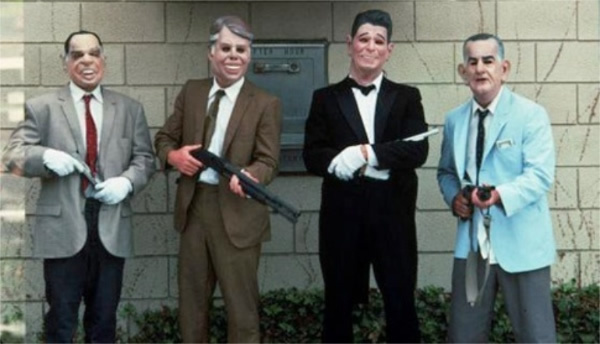 Image Break point movie, scene known as the Dead presidents Masks. The ONG International Transparency has estimated that Marcos and his clan took over a fortune of 5.000 y 10.000 million USD. The process to return the funds to Philipines which the Marcos clan sotld and hid in swiss government were a disgrace. Only 658 million were returned. Good luck finding the rest. And again another president, another playing card of the House of Cards. This man does not only take the price for the people�s misrepresentation, but he takes 5 billion USD. While in office he took to forming an authoritarian regime, amassed vast personal wealth, and attempted to purge the country of all colonial cultural influence, while also maintaining an anti-communist stance. And another President. But defacto one, which basically means, he is military man and took over by force, and stayed in power by force. Noted for being a monumental kleptocrat which seems to be a nice word to say CRIMINAL and TOTALITARIAN. He executed those who oposed him. The Swiss authorities consider the family Abacha a Criminal Organisation. They are not the only ones. Suspicion of corruptions, abuse of power, and other criminal activities, were the reason for his arrest in 2001, by the Yugoslav federal authorities. As there were no �evidence� to the Serbian Prime Minister Zoran Dindic, he was sent to the Hague to stand trial for charges of WAR CRIMES. The trial lasted five years, Milo�ević took over his own defence and died before the trial reached a verdict. Jean-Claude Duvalier, AKA: "B�b� Doc" or "Baby Doc was the Ruler of Haiti, took over after his father �Papa Doc�, so they called him �Baby Doc�. Thousands of Haitians were killed and murdered, other forced to self-exile. While the killing and torturing was going on, his regime took 300�800 million. Now he is back in Haiti, I doubt he is there for the view. This guy made a complete mess not only of Peru, but shocked the entire South American Region. Going back and forth, from different countries, he stood trial and was found guilty. Fujimori was specifically found guilty of murder, bodily harm, and two cases of kidnapping. Sentenced to 25 years in prison. Peruvian court sentenced Alberto Fujimori to an additional 7� years in prison for embezzlement after the former president admitted to paying the head of Peru's intelligence service (SIN), US$ out of the Peruvian treasury. He later plead guilty of bribery. Convicted and sentenced to prison in the United States for money laundering, wire fraud and extortion. According to the official count by United Nations, approximately $200,000,000 has been looted by Lazarenko during 1996-1997 from the government of Ukraine. Alem�n was formally charged in December 2002, and on 7 December 2003 he was sentenced to a 20-year prison term for a string of crimes including money laundering, embezzlement and corruption. AKA: ERAP. Background and Frontground: Military. Joseph Estrada. In 2000 he declared an "all-out-war" against the Moro Islamic Liberation Front. 10. Unkown. Status still to be elected by the people of some country or to rise by military force in some other.